Before I started working for NBwebexpress.com I had no idea what type of arch I had...well I knew I had one, but I was sure I had a very high arch and could wear any type of shoe on the market; from lightweight cushioning to a stability shoe...I was wrong! It turns out I have a neutral arch and need a supportive cushioning shoe. For years I had been wearing the wrong type of shoes. It explained so much to me; the bad knees, weak ankles, maybe even that not-so-great mile time last year. 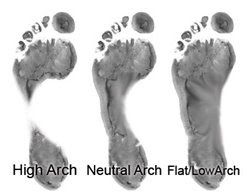 Now on NBwebexpress.com we have a new Foot Guide that can help you find your arch type and a shoe to fit your specific needs. So, if you have some free time and are looking for help in finding a shoe that fits right, check it out.